Conscious that this has become a little hard to find online, I thought it'd be worth posting a link to my PhD thesis, Production of Aluminium Foam using Calcium Carbonate as a Foaming Agent, from the Cambridge years, online. Because research is frankly no use unless people can access and build on it, and there's a fair bit in here about aluminium foams that's still interesting and relevant. This was the first time that anyone had spent any real time looking into calcium carbonate as a way of making foams, and to cut a long story short it turned out to be a very cheap and cost effective way of doing it - because the gas produced was (oxidising) carbon dioxide rather than the moire widely used (reducing) hydrogen gas, it made a thin layer of alumina on the aluminium cell walls and in doing so hugely stabilised the molten foam. This transformed what had previously been a pretty unstable production process, and meant that foams could be made on a far more industrial basis, with smaller cells. The document is a whisker under 200 pages, and if you're printing it you'll be better off doing it in colour, for the (many) diagrams to make sense. Do feel free to cite it - the British Library citation reference is linked here. I'm still always happy to answer questions on it, though I don't work in this field any more so my memory's frankly pretty rusty on the subject! Way back, I decided to plot out and lead a walk - for wither the Metropolitan Walkers or the Capital Walkers - which was of a sort of medium length, and with some of the useless London urban trivia that I know far too much of. Quite some time passed, but at last - here it is! 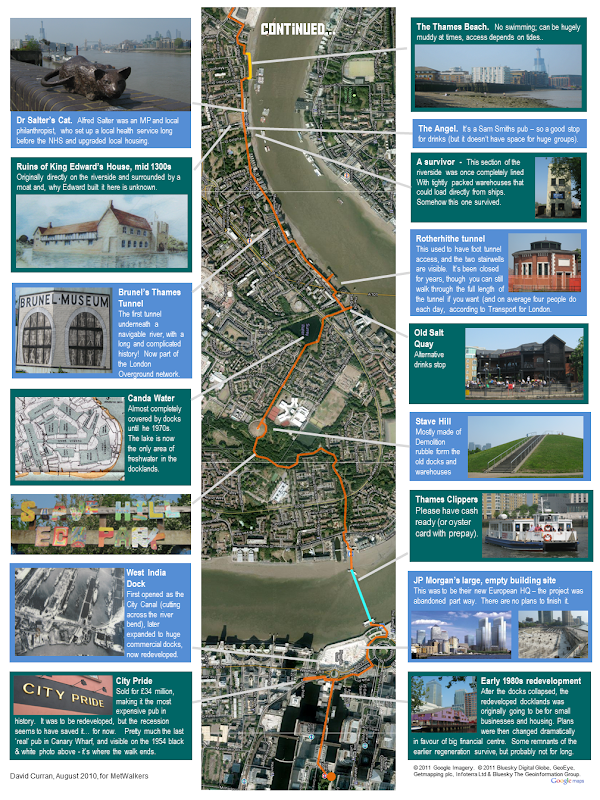 A relaxed walk south of the river, generally avoiding the tourist trail and stopping to see some of the, ahem, "lesser-known landmarks" of the area, which is a sort of code for the kind of thing I find interesting and pretty much no-one else does. It includes a short (costing just over £3) ferry trip to get across the river to Canary Wharf the river at the end of the walk. I'll be running it on Sunday 4th, starting at 11am at Lambeth North tube station. 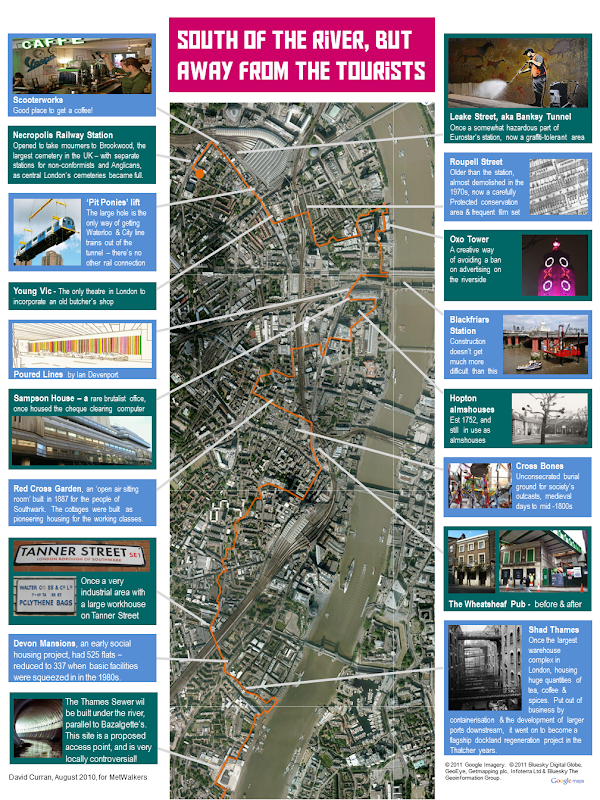 In case anyone wants to try it at any other time, the full & zoomable / printable version of the images below, which are designed as a sort of 'interesting features' flyer, is on Picasa. The walk's just under 8 miles long, and includes an interesting couple of pubs in the quieter second half (East of London Bridge). Here's the more detailed route plotted out on Google Maps (full version is here). Angus steak house - back from the brink? 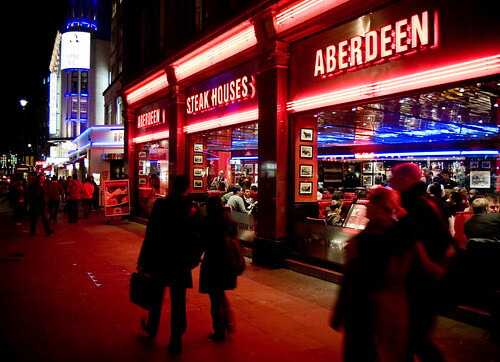 London has dozens of Angus Steak Houses and near-identical (apart from the name) Aberdeen Steak Houses, as well as the odd American Steak House. It's not unusual to see several branches within sight of each other - indeed at one point there were three on Shaftesbury Avenue, two of which were directly opposite each other. They have a curious history, which all started in a chance encounter when butcher Reginald Eastwood met accountant Tom Beale and bar-owner Peter Evans, whose bar The Cat's Whisker on Kingly Street in Soho had just been closed down by police due to overcrowding. With one eye on American chop houses, and the other on the increasing disposable income of Londoners - especially those out to see shows in the West End - they spent just a few weeks converting the premises into the first Angus Steak House, selling "supremely succulent Scotch steaks" at "prices that won't spoil your appetite" - and went on to develop 40-odd restaurants in inner London. More interestingly - these restaurants where some of the earliest to be developed in London - when the idea of eating out on anything like a regular basis was just starting to spread across the British population. They were pretty much all developed in the early 1960s with nay a penny spent on them since, and since we lost the late lamented New Piccadilly Cafe to a residential development project, these are one of the few "unmodified" restaurants in London that date from the middle of the last century. The decor is a proper time warp: signature red double sided banquettes lined up by the window, tarnished brass rails here and there on the inside, silver reflective slat ceilings, usually a neon 'cocktails' sign somewhere near the rear, bright red signage on the outside, rather harsh lighting, a 'today's specials' board that's the save every day. It's fair to say their reputation among Londoners has not been a good one in recent years. They're generally viewed as dreadful tourist traps, with online reviews are ranging from merely appalling to scathing even by the standard of review sites, pointing to pretty mediocre food, high prices and woeful service. The staff are apparently so disinterested haven't even bothered to intersperse the reviews with occasional 5-star "brilliant - the best in London, staff were great" efforts by "Bob" and "Sarah". Many wondered how they keep hanging on, given that (along with visiting Madame Tussaud's, and eating anywhere near County Hall) they're somewhere no Londoner would be seen dead in. By the time they were bought by Ali Salih, described on Wikipedia as "a Turkish businessman with a low profile", they were already about 20 years out of date - and absolutely nothing changed under Salih's ownership. Much of the reason they keep going is no doubt their extremely good locations - presumably when the sites were originally acquired, they were cheap - they tend to have prime corner locations on major thoroughfares in the West End, and are also sited opposite most of the main railway stations. They're also good at having a multilingual menu, and the sheer visibility and brashness of the restaurants probably pulls in some of the tourists. This wasn''t enough, though, and - after selling off some sites in Soho to stay in business under Salih's ownership, and feeling the heat from the BSE crisis and a post-9/11 drop in the tourist trade that made up much of its clientele - the chain bowed to the inevitable and went into administration in 2002. Nine more branches were sold off to pay debts, and the remaining 21 (around half the peak size of the chain) were sold to Noble Organisation, a company better known for owning Brighton Pier and running amusement arcades. And that, it seemed, was it - they struggled on, generally giving Aberdeen a bad name and making the most of unwary tourists, but still seen as something of a laughing stock among Londoners. Everyone pretty much assumed that at some point Noble would deliver the coup de grace and the poor old Angus Steak Houses would be kicked out to make way for something else more in tune with the times. On St Martin's Lane, there's an 'Angus Steakhouse' that doesn't fit the mould. My photo doesn't really do it justice - it looks pretty decent. Elegant floors, wood panelled walls, subtle lighting, and a frankly stylish interior. The only sign that this actually is one of the chain, apart from the name, is the red banquettes that have become a bit of an icon for the chain (albeit upgraded to a more sophisticated leather version, and restricted to a few tables down one side of the restaurant), and a pair of (rather thin) red lines on the main sign. About five minutes' walk down to road to Covent Garden, there's another newly-refitted Angus Steakhouse - quite an interesting setup where the kitchen's visible from the street, again preserving the old red seating theme but in a subtle way. On close inspection, the Leicester Square branch has had something of a refit as well, though not as much of a change as this branch. They've even got some rather decent reviews (most of which seem equally surprised), with what seem to be decent staff and decent food - so presumably some changeovers have taken place. So - maybe it's not the end of the road after all? It's interesting that Noble see value in the brand - it's certainly a famous one (everyone has heard of the Aberdeen Steak House), and brands do count for a lot in British restaurant choices. I reckon if it can be turned around - and that is something of an if - it could work. Not that many other people are in the steak market in central London (the odd branch of Cote, and the odd one-off, pretty much sums it up at the mid-price level), and it still seems to play well with tourists. Some good media coverage & reviews could help, unless they're relying on people seeing the (quite radically) changed looks of the branches and deciding to experiment again with something some of them will have deserted years ago. And they'll need to get a reasonably even standard of restaurant - while the new ones look good, there are still some branches that have barely been touched. It's good to see that someone is taking a punt on the Angus Steak House. If it works - and this branch at least looks like it could well work - it could one day become a case study of turning around a reputation. 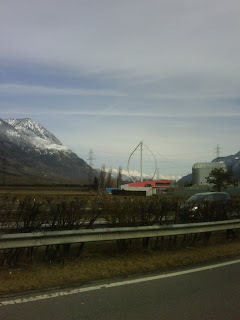 Anyone who's driven along Switzerland's main East-West motorway near Martigny will have seen the rare experimental wind turbine in this photo. It's a Darrieus vertical axis turbine, and has been there since 1987. It was hugely experimental at the time, and I believe there's even some complicated connection with the adjacent sewage works and biogas plant (which is also quite innovative), though - possibly as its main use was well before the web kicked off - there's precious little about it online. It's in one of Switzerland's windiest valleys - but the most famous feature of this turbine is that it's hardly ever rotating. I think I've only ever seen it in action twice. It was also taken down at various points in its lifetime - sometimes for several years; indeed on Google Maps' aerial photo (here) you can see it lying down - but now it's back up. This old and now largely abandoned turbine is all that remains of an alternative future for Swiss energy - a future that never happened. For all of the early inventiveness (and its location right next to the motorway means it's quite widely recognised, even if a lot of people don't know that it's a wind turbine) you can't avoid the feeling that Switzerland decided early on to 'pass' on wind energy. In the last few years a pair of more conventional wind turbines have appeared a few kilometres down the valley - though for all its green-ness, the biggest wind farm in the country still has just eight turbines. A glance at the landscape gives some idea why - deep valleys, and huge mountains, don't really provide the ideal conditions. Unpredictable and variable wind doesn't help. And the scenery in the windy areas is mainly quite heavily protected (it's no accident that the current wind farms tend to be in industrial lowland areas). All said, renewable energy may not be needed in Switzerland - fully 94% of its electricity is already 'low-carbon' (56% hydroelectric, the legacy of a dam-building programme in the 1950s onwards of unimaginable proportions, and most of the rest nuclear). But in a surprise move, immensely costly solar panels are currently appearing everywhere, with some cantons (regions) apparently offering generous subsidies. Hard to say where the rest of Switzerland's future electricity capacity will come from - so far, energy use is on the up, and nothing has emerged as a strong option. They've bene busy increasing the capacity of the dams (which literally, in this case, means building the existing dams a bit higher!) - and the ability of the dams to accommodate fluctuations in generation means they could have up to any amount of renewable energy. There's also a strong wariness of imported energy supplies. Could wind ever make a comeback? Google Maps doesn't always get the destination right first time. And just occasionally, you stumble across something genuinely strange in the process. Take Port Charlotte in Florida, which I arrived at by accident. Miles, and miles, of roads laid out - but no houses. A closer inspection shows that these roads are not new, and there's no sign of any building or development going on. There is a small city centre - but these empty suburbs surround it in all directions and cover more than five times the total surface area of the populated town. If you follow the link, and switch to street view, every single road has been photographed by the Google Street View car - showing nothing but mile after mile of roads running through scrubland. There's another similar one in Cape Coral (link - opens in a new window) - complete with a large complex of marinas and harbours to the north west of the city centre. And it's not just a Florida thing - try California City, deep in the heart of the Mojave Desert, and about 150km north of Los Angeles. Again a fairly typical American suburban layout - but in the middle of the desert, and with no houses in sight. Flick between the 'aerial' (above) and the 'map' (below) view, and it looks like a fairly major development. Note that the roads on the left half of the above image have never even been declared roads (so do not feature on the map below) - presumably at some point whoever was building the roads just stopped bothering with all the legal paperwork needed to get them officially recognised. "This is a remote area and only limited services are available. As of 2005, there were no gasoline stations and no lodging open to the passing public. Rental cabins are sometimes available, and other services are advertised on the posting board at the Community Center. Travelers are advised to top off gas tanks and procure potable water and food appropriate to their travel plans in advance." Google Street View of California Valley (link) suggests a rather spectacular landscape, but little potential for actual habitation. So what happened to these 'cities'? Who built, and who paid for, these crumbling road networks in the desert? Where were all the inhabitants going to come from, and why did they not come? These cities were developed by real estate speculators in property booms in the 1920s and late 1960s (with a particular boom between 1969 and 1973). The business model was a simple one: buy a vast tract of rural land (preferably in the desert or somewhere out of the way, and correspondingly cheap), subdivide it into tens of thousands of small plots just big enough for a house and garden, lay out road systems (and, sometimes, rudimentary facilities), and employ salespeople to sell the plots on to aspirational Americans who want to buy their very own slice of the 'American Dream'. The marketing touted the property as having tremendous investment potential, citing authorities with quotes such as: "Ninety percent of all millionaires became so through owning real estate." The economic case was a compelling one - as land was worth far more when subdivided into platted lots', and zoned as urban land, than when it was bought in bulk as farmland (or, more often than not, desert, marsh or scrubland) - and people in far away cities who had never been to visit the areas could (with a bit of carefully targeted advertising) be sold plots of land for far more than they were really worth. In some cases there was a hint of a grander vision - for example in the case of California City, real estate developer and sociology professor Nat Mendelsohn purchased some 490 square kilometres of Mojave Desert land with the aim of master-planning California's next great city. He designed a model city, which he hoped would one day rival Los Angeles, around a Central Park with a 26-acre artificial lake. Growth did not happen quite as quickly as he expected, and the city ended up as a grid of crumbling paved roads, intended to lay out residential blocks. And why did they fail? There are a variety of reasons. 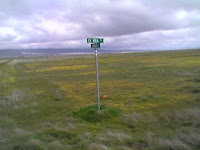 In California City the central area was cleared leading to huge dust storms, and in California Valley a planned irrigation scheme never materialised (leaving the city stranded in one of the most arid and inhospitable parts of the USA). Sheer oversupply was an issue in Florida. But above all, these areas were developed and sold purely speculatively as a 'dream retirement home plot ' by rather fly-by-night developers - who probably knew that the infrastructure needs of these cities (in particular the water supply) would never have been able to be met. It was only when the happy landowners arrived at their remote patch of desert that the sheer difficulty of building and servicing a house miles from anywhere, with no water, electricity, sewerage, let alone local services, sank in. These 'platted lots' (so-called because they are 'platted', or subdivided in the local land registry and assigned to individual owners) are a major drain on the resources of local government due to the huge number of roads and utility networks that have to be maintained for the tiny number of inhabitants that did actually persevere and build houses. The number of such schemes, and the impossible-to-service subdivisions they led to, subsequently led many states to introduce planning laws requiring sewer, water and power to be provided before plots could be sold. But the aerial photo reveals a rather different scene, with the odd dilapidated house (almost all of them, on closer inspection, as well as the airport terminal, are completely derelict). These google maps images can be dragged - if you try with the one below, go south in a roughly straight line and you'll eventually see the airport. For reasons that are anyone's guess, Google's street view cars have gone round dutifully photographing the streets of most of these 'towns' (especially the Florida ones, where every street seems to be recorded). It's a desolate scene - the image below is a typical view in Salton City (and again you can drag it around). All the streets are paved and they have the same American-style street-name signs you'd see in any city. There's also an extensive network of what look like well maintained fire hydrants for the homes that were never built. Here's a view of Salton City's rather forlorn looking airport. It's set by a network of streets slightly separate fom the main city with themed names including 'air park circle', 'air park drive', 'skyway drive', 'skyliner court' and 'palm air court', all of which are completely empty and seem to have been designed as an airport business centre. Salton City failed for a rather different reason: the town was initially developed in the 1950s as a resort community on the Salton Sea, an inland sea which had been accidentally created in 1905 when heavy rainfall and snow melt caused the Colorado River to swell and breach a dyke, and fill the formerly dry valley with water. It was stocked with fish and became a major tourist and retirement destination, but as with any inland sea, with water flowing in across the desert but leaving only by evaporation (think of the Dead Sea), the salinity of the already highly polluted sea rose, the fish died, and it gradually became rather a health hazard. By the time Salton City (and several other similar towns round the shore of the lake) was ready to be inhabited, it was already clear that the city was in deep trouble. Very little development took place and most of what was built - including several hotels, the airport, and the city's marina - was abandoned. Today it's a place that attracts a few loners, travellers, misfits and people who want to get away. It notably featured in the 2007 film 'Into the Wild', about the story of Christopher McCandless. "Lonely canals and little-used roads criss-cross this cypress swamp turned subdivision, which was originally platted in the early 1960s by the Gulf America Corporation. The company dug canals to drain the wetlands and carved the property into 1.25-acre lots. It then promoted Golden Gate worldwide as a vacation and retirement community. Most of the lots were sold by 1965, but unsuspecting buyers still get suckered into paying over $15,000 for a lot worth about $3,000. In 1974, when the area was less than 10 percent developed, it became apparent to county officials that the project, with limestone roads and no centralized water and sewer system, could not support the number of platted lots." A look at the aerial photo says it all. Compare this with the level of planning that has clearly gone into Salton City - in contrast at Golden Gate the road layout is the most rudimentary possible - with long straight unpaved tracks that don't even connect to each other. There were no services or utilities of any kind, no schools or provision for any kind of employment, and little prospect of any being developed, and certainly no intention of developing a town that could actually work. The development eventually went bankrupt, but (along with several similar schemes that followed) gave rise to the expression 'I have Swampland in Florida to sell you'. The Golden Gate estate continues to be a particular headache for all concerned - on top of all the other problems, it's in the centre of a very ecologically sensitive area (and street names like 'alligator avenue' hint at what lurks in the swamps). The cash-strapped municipality is doing its best to prevent further development and consolidate the land into the neighbouring national park - but untangling legal ownership of the thousands of plots (many of which were abandoned by their owners over a generation ago), and consolidating what development may occur, is a difficult and costly process. There is little incentive for any developer to tidy up the area (for example by adding drainage, lighting, pavements and utilities) because the land is already sold, and it is nigh-on impossible to assemble enough of the tiny lots in any area from their absentee owners to make a viable modern development - which seems to condemn these areas to sit in this strange partly-developed state for the foreseeable future. City governments know that they will never be able to supply utilities to all these scattered lots, or maintain the roads, even if it wanted to - and across the US are gradually tightening the rules to prevent the small nuber of people who still try to develop these plots of land (sometimes insisting small plots be combined to larger and more viable ones, banning development in areas altogether in the remoter parts of these zones, or offering more suitable plots nearer the city in exchange for remote ones). These scams still take place regularly, albeit not on such an epic scale, and the existing plots of land (in these cities and many others) continue to be bought and sold on the internet at inflated prices. Many also still cling to the notion that they might just, one day, build that dream home on that plot of land in California they inherited from their grandparents. PS. There's a good article with more on these failed settlements, and what became of hem, in an article by Hubert Stroud - Planning of the wake of Florida Land Scams. 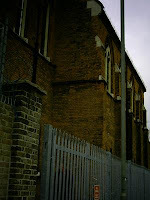 Back when I lived in North Battersea, I grew a bit curious about an old (and rather run down) church, lost in a tangle of industrial units and luight warehousing in the unfashionable bit of Battersea. As a bit of out-of-place Victoriana it was a bit of an architectural curiosity, that seemed to have survived long after all its neighbours were bombed, demolished or redeveloped between the 1940s and 1980s. Caius House (variously known as Caius House, Caius Mission, Caius House Church and Caius College Mission Church) was on Holman Road in Battersea - and as of January 2009, Caius House is no more. Even when I lived there, the rapidly gentrifying nature of North Battersea means that Caius House was increasingly surrounded by new developments of flats and offices, and looking increasingly isolated among the building sites. It was demolished to make way for a new development of 73 one-and-two bed flats, which will incorporate a new and larger mission, still called Caius House, on the ground floor - with flats above (there will be river views from some of the flats). There are details & artists' impressions on the Thornsett Group website here. the last I heard, foundation work was scheduled to start at the end of February 2009. Much of the original building dated to 1892-3, when Caius House opened as a joint venture between St Mary's Church in Battersea (just up the road in the more fashionable Battersea Square) and Caius College, Cambridge. It remained in the parish of Battersea, St. Mary. The mission seems to have started earlier than the building housing it, in 1882. An extension was built in 1897, and a further extension in 1906 (source: www.churchplansonline.org). There was a newer (1970s?) extension around the entrance area, at the front in the top picture. Caius House housed an assortment of clubs and activities, including being the meeting place of the celestial church of christ. People spending Christmas Day alone were usually invited to join in celebrations at Caius House. It briefly hit the news in January 2002 when Patrick Burgess, treasurer, in Battersea, was made a MBE for services to the community, in particular the Caius College Mission. There was, and is, almost nothing about Caius House online. Edward Wilson - the artistic scientist who died with Captain Scott - briefly took up residence in the Caius Mission house in Battersea, where he became engaged in youth clubs and Sunday school classes for the children of the Battersea slums. Occasionally, he took services, "talking, praying and singing in a positive reek of 250 Battersea children", who sare reported as suffering from fleas, lice and numerous medical afflictions. "The Settlements, as they are called, [are] where educated men and women, putting theory into practice, take up their abode with the poor, striving by force of example to raise the moral tone of the district in which they have settled. [...] The University of Cambridge has taken charge of the vast population on the south of the Thames, as Oxford has done in the East-end. Cambridge House and Hall is their headquarters in a district said to present the largest area of unbroken poverty in any European city; and, as in a semi-circle, South London is apportioned to various colleges; for instance, St. John's works in Walworth; Caius, in Battersea; Clare, in Rotherhithe; Corpus Christi, in Christ Church district, Camberwell; Pembroke, in Newington; and - chief of them all - Trinity, in St. George's Park, Camberwell." The surroundings can best be described as fairly bleak - featuring a couple of office/retail buildings that didn't really take off and were converted to self storage warehouses, some light industrial units, and a large branch of Travis Perkins. 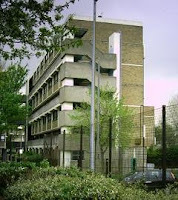 However the area is dominated by a series of 1960s estates and tower blocks. 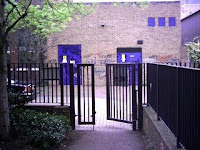 The picture to the right shows the gate to Caius House from the neighbouring park, below is part of the Yelverton Road estate and the view south from Caius House towards the towers of the enormous Winstanley estate. There is a fairly large electrical substation to the north, and another one to the east (not pictured) opening onto Lombard Road, built in 2003-4.The building still had most of its original windows towards the end, though some of the panes seem to have fallen out over the years. The general state of repair was fairly good, given that it was in a fairly run down area, though seemed to vary between different bits of the building. The most impressive feature of the building was a stained glass window located in the western gable on the first floor. It has been identified as a design by Sir Edward Burne-Jones by the Victoria and Albert Museum. Sir Edward Burne-Jones (1833 - 1898) was an English artist and designer closely associated with the Pre-Raphaelite Brotherhood. This window commemorates the lives of four young men who died tragically in a drowning accident in Saltdean in August 1912 while the Caius Summer Club was in session at Rottingdean near Brighton. Lady Georgiana Burne-Jones had a home in Rottingdean and, upset by the tragedy, offered to release an Edward Burne-Jones memorial window to the memory of the four boys (Edward Burne-Jones had died in 1898). 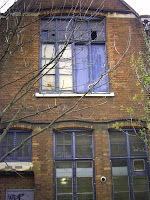 It is intended that the window will be removed carefully during demolition and reinstated in the new building. Avery old guide to punting from Cambridge to Grantchester - picking out some of the highlights. Not especially useful bitit seemed a shame to lose it. All punt trips using St John';s college punts start (and hopefully end) here. Note the swan nest on the island in the spring (sometimes populated with rare black swans, imported from New Zealand and only usually seen in St James' park in London). A little-known tributary of the River Cam; it is shallow and muddy. It has been known for Johnians and lost tourists to punt down here. That said, it isn't exactly one of the highlights of Cambridge. You can't go much further than Jesus Green without permission to use the lock, as the river below is infested with boaties and houseboats. It is puntable (albeit quite deep) and a bit of an adventure. 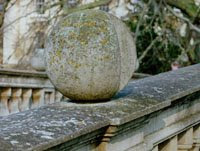 There's an engraving of third court, with the bridge in it, on one of the piers facing the bridge of sighs. Note the flood lines on the south side (there's also another much higher one - a couple of metres higher - of the southernmost pillar in Third court). The punts are all named after things associated with three (french hens, toed sloth, fate, musketeers, steps to heaven...). Go right past them without looking, while drawing attention to the superior red punt you're in and loudly saying 'You'll never be at John's'. You'll notice that the archways are visibly bent (this happened soon after it was built, though it's stayed stable ever since). Also, one of the stones is missing a slice (apparently the stone mason wasn't fully paid, so didn't complete the bridge). Hard to say exactly where this is - it cruises up and down the river selling ice cream to punters and people on the bank in the peak of the summer. Recognisable by the large sign saying 'Wall's'. The best view of it is from the river. Note the spikes on the turrets to stop people climbing them. The large field with cows in it was supposed to have courts built on it too, but the money ran out. Years ago there used to be sheep, but they got found in the corridors at night once too often! Their (purple) punts are mostly named after kings. If you turn right immediately after Kings bridge there's a side river that you can punt up, leading to the back of Queens. It's a bit overgrown, and not one for the learner punter. You can moor punts here at the terrace, though best to go right under the road bridge or Scudamores will find you in the pub to complain. One of the most popular punting pubs, and actually underwater from time to time when the river is in flood. This pub makes all its profits in the summer, by selling drinks to thousands of people on the island next to it. The island itself is generally full of tourists and cows. Fairly easy to herd the cows so that they surround groups of foreign tourists, who sometimes don't know they're vegetarian. The less crowded of the two lakes. Take the punt up the small side river through the gardens of Darwin College to get here. Two small islands to your left are owned by Darwin College. You can punt a bit further under the small white bridge if you're determined, but it soon turns to marshland. A classic punting pub facing the mill pit, generally less crowded than the Anchor. The old mill is now Bella Pasta restaurant, though you can still scare the people on your punt by punting into the tunnel underneath (which used to be the mill stream). If you look up inside the tunnel you can see the underneath of several glass tables inside the restaurant (no, really). This section of the river is higher up, and tends to have more students than tourists. The river is deeper and wilder. A set of wheels where you can push the punt up the 1 metre height difference to the upper river, by-passing the weir. Punts are heavy, and some of the wheels are missing! On the way back, if you all sit in the punt as it rolls down, it will sink (and there's usually a big audience with cameras). The adjacent weir is where good swimmers can try white water punting. After the last road bridge, the river bed is actually paved, as this section was used as a swimming pool of sorts in the 1900s. There's still a paddling pool in summer. A colony of not-too-friendly geese is often in residence here. Also formerly a swimming area, now somewhat overgrown. Several grassy clearings make this a popular place for barbecues in the summer. This is as close as Cambridge gets to a forest (and it's not very close). Some trees have ropes to swing on; there are a number of student residences (abnd what was an abandoned hospital) lurking among the trees. A large area of open countryside, sometimes quite crowded in the summer. If you look back, there's a good view of Cambridge. All you can see is the University Library tower and (of course) Johns' chapel. Small village including four pubs (The Red Lion, The Blue Ball, The Green Man and The Rupert Brooke), a few houses, and a church. Of the pubs, the Red Lion is the nearest to the river and has a large garden, often full of suspiciously wet-looking students. Rupert Brooke, who lived here as a student, wrote 'The old vicarage, Grantchester', one of his most famous poems. A long Cambridge tradition (since 1897, apparently) sees students punt here for tea on deckchairs set among the apple trees. A traditional destination after May Balls. Now expanded to include an indoor restaurant. This is the little-known official name for a punt pole. The first record of this word was in 1440, when it was common to see barges in Norfolk pushed with similar poles. It later led to 'quanting' being known as an alternative name for punting. Each college (and a few of the commercial punt hire companies) has its own colour, in order to identify lost poles - some of the more common ones are illustrated aboveon the rigrht. Scudamores is probably the biggest of the punt hire compaies, and you'll see a lot of their poles around. There are also (rare) aluminium poles, and even carbon fibre ones - they're better but they need to be treated with respect to avoid damage, so don't tend to get hired out as much. 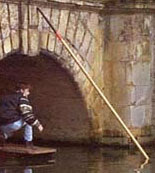 Punts were originally developed for shooting wild fowl, and the punter would stand somewhere in the low bit of the punt with a big gun on the platform (which was the front of the punt). When punting became popular in Oxford & Cambridge, Oxford stubbornly kept punting in the traditional way, without using the platform, whereas people in Cambridge soon realised that it was far easier to steer by standing on the platform, using the punt in the opposite direction. Even now, if you go to Oxford, you'll see some die-hards punting at the wrong end of the punt. A few of these were recently introduced at Oxford, on the grounds that it was easier for the tourists. Vetoed in Cambridge on the grounds that it was too tacky.